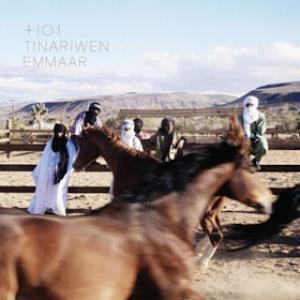 The magic nomadic Tinariwen chose America’s Mojave desert to record their sixth album and as in their previous efforts a barren landscape inspires fruitful music. A primordial coil of transcendent chemistry, “Emmaar,” feverishly teeters between electric shaman trance-rock and acoustic tribal-blues grooves; knotted labyrinths twisted around hallucinogenic tensions drawing numerous luminous traditions to unleash waves upon waves of shimmering synergy. This six-piece band’s steady meditations erupt in ecstatic flashes as thin whirlwind rhythms conjure hypnotics beats beneath murmuring prayers and snake-charmer guitar; Formed in an Algerian refugee camp thirty-five years ago, the band has literally fought to create their music, uniting a brotherhood that transcends political and cultural boundaries. In what will surely be a mind-altering performance, Mali’s finest play Madison’s Majestic Theater April 8th.